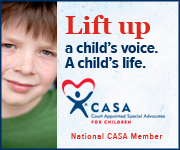 I am grateful and overwhelmed at the support that was shown to CASA staff, advocates, and board of directors today. Thanks to all the officials who took time to come out today 4/18/2016. Thanks to the Athens Area Chamber of Commerce. 107 1/2 Park Street Athens, TN 37303. 345 N. Main Street Decatur, TN 37322.